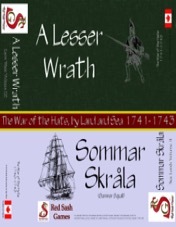 Somar Skråla (SS) and A Lesser Wrath (ALW) are a pair of games dealing with the Russo-Swedish War of 1741-1743, sometimes called the Hats' War or the War of the Hats. SS examines the naval war and ALW the land war. While boxed together, the pair are completely separate games; rule for linking the two are included. 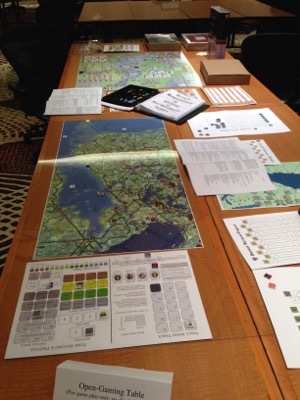 Both games are operational in scope, and both are for two players: Swedes versus Russians. 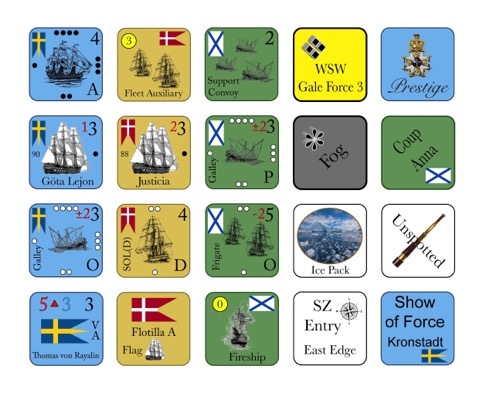 The Danes are an optional third side in the naval game. 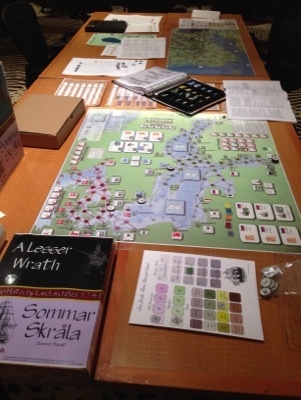 When combining the games, four (or five with the Danes) may play. In 1741, while the rest of Europe involved itself in yet another interminable succession war, Sweden and Russia squared off in yet another of their own squabbles for dominance in the Baltic. The Russian monarchy was unstable and a cabal of Swedish Hawks - whose party was known as the Hats - sought to replace the current empress with a ruler friendly to Sweden. In addition, the Swedes would claim some territory lost to the Russians during the Great Northern War. France, Sweden's paymaster, encouraged this plan, hoping to distract Russia from affairs in Europe. Either the new ruler would grant them the land they wanted, or the Swedes would take it by force. It was a daring plan, and really beyond Sweden's means, yet it almost succeeded. The coup went off as planned but the Russian Army, led by one of Europe's best generals, the Irishman Peter Lacy from County Clare, struck first, upsetting the Swedish timetable. Instead of managing the coup from the Winter Palace the Swedish military was floundering in the snowdrifts of Karelia when the new regime came to power. When their proxy doublecrossed them, the Hats challenged Russia to trial by combat. This has to be one of the most obscure conflicts Red Sash Games has covered to date. But, measured by the butcher's bill it was hardly a minor affair, with 50,000 casualties. Historically, it was a fiasco for the Swedes, but this was partly due to bad luck - an epidemic ravaged their fleet - and partly due to internal politics. Surely, as the Swedish Generalissimo, YOU can do better? If you prefer certain victory, the Russians have many men but they are on a tight schedule since the diplomats are already finalising the peace terms. Will you be able to make a name for yourself before they pull the curtain down? As the Swedes, you have declared war on Russia under cover of assisting an 'internal regime change'; if your coup misfires you will have to defend yourself against an overwhelming counterattack. As the Russians, you must first prevent the Swedish from making any gains, then take the war to them. Only when Finland is a demilitarized Russian puppet state and a pro-Russian goivernment sits in Stockholm will the Motherland truly be secure. SS adds a new dimension with the inclusion of the Danes. The Danish Prince Royal was a candidate for the Swedish throne (Sweden's monarchy was elective even at this early date) and the Danish king assembled an invasion force to assist a Swedish 'internal regime change' (sound familiar?) through defending Sweden against Russia. Ultimately, Sweden choose a Russian candidate and the Danes nearly declared war on Sweden, until a Russian corps arrived to defend Stockholm! 1) The map for SS covers the whole of the Baltic Sea, using a point-to-point system of movement based upon the various prevailing winds. ALW covers the shores of the Gulf of Finland, where most of the fighting took place; scale is 4 leagues (16 Km) per hex. 2) SS has 360 die cut counters plus (in the boxed version) about 20 wooden disks. These represent Swedish, Russian, and Danish naval forces. ALW has 480 counters representing Swedish and Russian land forces. 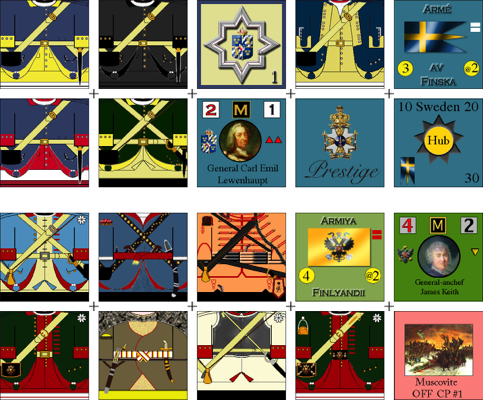 Scale is Battalion - that is, the playing pieces represent battalions and regiments. 1) choose the appropriate shipping option. 4) If you prefer a payment method other than PayPal™ contact us by email at rsgmail@shaw.ca or use the contact form at the bottom of the page.